If your feet are dangling from your seat, it will place additional stress on your back. So if your seat is high, use a footrest (or improvise to make a footrest) so your feet have a firm surface to rest on and your knees are at a right angle. While driving, keeping your foot on the accelerator can also stress your lower back, so consider using cruise control if you’re on a long drive. Unless you’re used to lugging around 50 pounds of awkwardly shaped baggage, you can expect that carting heavy luggage through airports and in and out of car trunks will take a toll on your spine. Avoid this by packing light (carry-on only?) or at the very least using curbside check-in so you minimize the struggle. If you will be carting your luggage for any distance, be sure your suitcase is on wheels. This may be surprising, but dehydration can worsen pain and muscle tension. Be sure you drink plenty of water throughout your travels while at the same time avoiding hydration zappers like coffee, tea and soda. Some upscale hotels are now offering pillow choices to make guests feel at home, but this is far from the norm. Many hotel pillows are too flat, too soft, too hard, or too puffy to provide adequate support for a good night’s rest. Ideally, your pillow should help keep your spine in a neutral position while you sleep, which will reduce stress and tension in your body and help you avoid problem spots and pain in your back and neck. If you can’t bring your pillow from home, try to adjust the hotel pillow so that it fills the empty space between your head and the mattress naturally, without pushing your head up or not giving it proper support. If it’s still uncomfortable, ask the front desk for a new pillow, or try sleeping with no pillow at all. 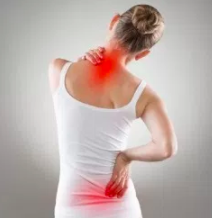 According to Dr. Mark Wiley of The Healthy Back Institute, “the number one complaint by plain, train and automobile travelers–when describing the onset of their back pain–is sitting for too long. But this can’t be avoided, can it? If you’re on a plane or train, yes it can. Make a point to get up from your seat to stretch your legs at least once every hour. If you’re driving, make rest stops often to avoid tense muscles and cramps. When you’re sitting, be sure you avoid pitching your shoulders forward, and use a small pillow (or even a rolled up jacket) for extra support behind your low back or neck. A u-shaped neck pillow can help to reduce strain on your neck while you’re resting or trying to sleep while in a seated position. Your seat back should be reclined at a 100-110-degree angle to reduce pressure on the discs in your low back. If you live in Brisbane and suffer with Back and neck pain. Give us a call or book online.